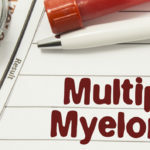 Triplet treatment with the combination of pomalidomide, cyclophosphamide, and dexamethasone (PCD) in patients with relapsed or refractory multiple myeloma (RRMM) who have received at least 2 prior lines of therapy could improve clinical outcomes, according to study results published in the Annals of Hematology. The researchers retrospectively evaluated 49 patients with RRMM who were treated with a median of 7 cycles of triplet PCD. Patients reported a median of 3 prior lines of therapy. All patients had previously received treatment with proteasome inhibitors and lenalidomide. The overall response rate was 76%, with 27% of patients achieving very good partial response. Median time to best response was 3.6 months. No patients achieved a complete response. The authors noted this could be because none of the patients who experienced immunofixation underwent bone marrow aspiration, as bone marrow aspiration is rarely performed outside the context of clinical trials. After a median follow-up of 16 months, median progression-free survival (PFS) was 7.3 months and median overall survival (OS) was not reached. Nine patients had high-risk cytogenetics, and median PFS was shorter in this group (3.3 months) compared with patients who had standard-risk cytogenetics (7.9 months; P =.0027). OS was similarly shorter in patients with high-risk cytogenetics, at 6.5 months compared with not reached (P =.003). The most frequent adverse event was hematologic toxicity, with 37% of patients experiencing grade 3 or 4 cytopenia. Adverse events resulted in discontinuation of therapy in 18% of patients. The authors concluded that treatment with PCD was feasible and cost effective, and that it resulted in improved response rates and PFS compared with doublet pomalidomide and dexamethasone treatment, which is currently the standard of care in this patient population.